The Eighth Judicial District Commission on Judicial Performance unanimously (10-0) recommends that Judge Mary Joan Berenato BE RETAINED. 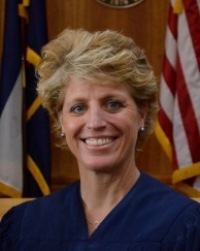 Judge Berenato was appointed to the Larimer County Court in 2013. As a Larimer County Court Judge, she presides over criminal, traffic, and civil cases, including small claims. Prior to her appointment, Judge Berenato served as a District Court Magistrate in the 8th Judicial District for ten years, presiding over matters in the Juvenile Court, the Juvenile Drug Court, and the Domestic Relations Court. In 2007, she was named Outstanding Judicial Officer of the Year for the 8th Judicial District and for the State of Colorado for her service as a district court magistrate. Judge Berenato received her Bachelor of Arts from Colorado State University in 1986 and her law degree from Temple University in 1990. Judge Berenato is engaged in community service activities and makes herself available as a guest speaker at Colorado State University, the University of Northern Colorado, and local schools regarding the role of a judicial officer. The Commission conducted a personal interview with Judge Berenato, reviewed opinions she authored, observed her in court, reviewed comments received from interested parties during the evaluation, and reviewed survey responses from attorneys and non-attorneys who had experience with Judge Berenato. The survey asked “How strongly do you recommend that Judge Berenato be retained in office?” Of the attorneys and non-attorneys completing surveys 82% of the combined groups recommended retention. Of the attorneys responding, 70% recommended retention, 24% recommended non-retention, and 6% made no recommendation. Of the non-attorneys responding, 90% recommended retention, 8% recommended non-retention, and 2% made no recommendation. A total of 33 attorneys and 49 non-attorneys completed the judicial performance surveys regarding Judge Berenato. Judge Berenato received high marks from both attorneys and non-attorneys who responded to survey questions in the areas of case management, application and knowledge of the law, communications, demeanor, and diligence. The Commission finds that there is a concern among some that Judge Berenato’s judicial philosophy does not allow for certainty in negotiated agreements. The Commission further finds that this philosophy is rooted in her belief that it is her judicial duty to retain decision making authority. The Commission finds that Judge Berenato is highly professional and she treats all parties with dignity and respect. Judge Bernato is self-reflective in her desire to improve her performance as evident in the improved judicial survey results from mid-term to the most current scores. The Commission believes she is a strong judge who is dedicated to learning and whose performance will only improve over time.